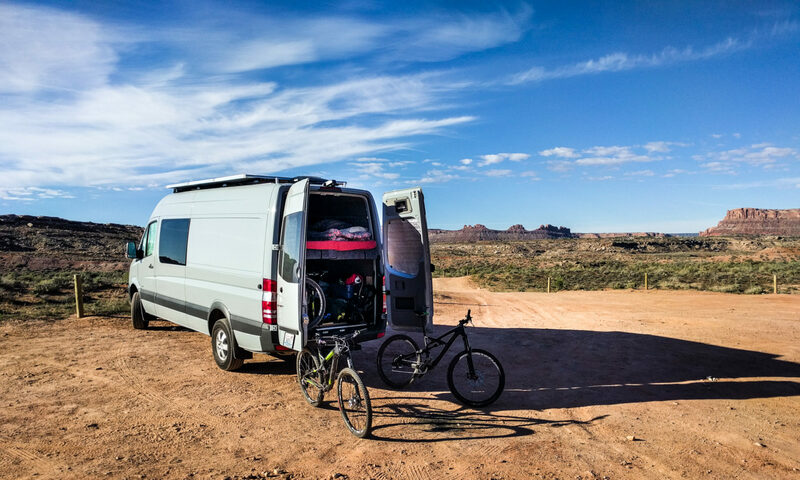 The 4×4 Sprinter is high off the ground. The climb up to the back doors is harder even than at the sliding door, so we added a hitch-mounted step. 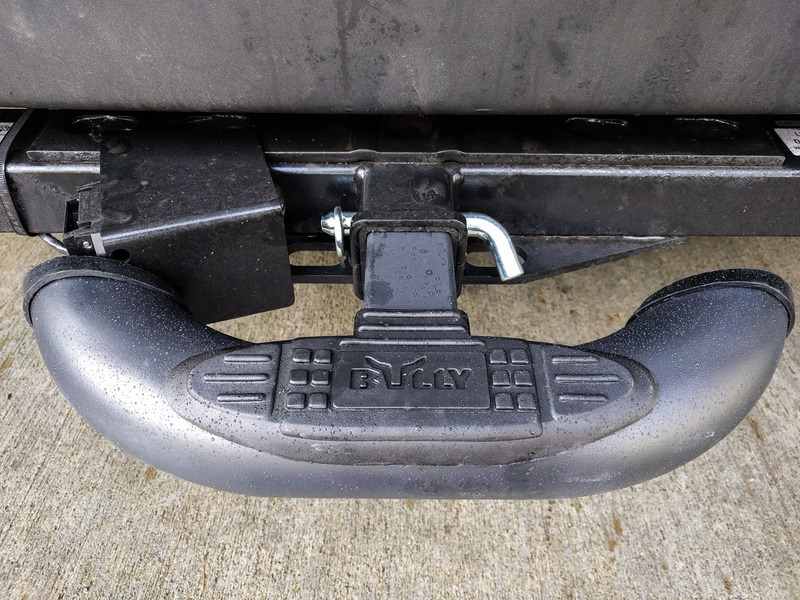 We chose the Bully Black Bull utility step, but there are several other options (and price points) too. We added an electric step on the passenger side that makes passenger door and sliding door access much easier. What we found was that we’re in and out of the back doors a lot too. An electric step there would just be overkill, when you can buy several different hitch-mounted steps that have the added benefit of maybe protecting the van in a crash. We weren’t really after the recovery option, and we didn’t want to spend top dollar for a shock absorbing hitch mount to really help out in an accident, so we looked for steps that worked well for their primary purpose (getting into the van) while also looking OK and maybe acting as a warning or first line of defense against other motorists in a parking lot. There are a lot of hitch mounted steps available. Here are a couple of the options we considered. Curt make a Step Pad, which is about the most basic step design you can get. A flat piece of metal welded on to the receiver mount. Reese have a Tow and Go Hitch Step that bolts on to your existing tow hitch ball. It’s cheap, but it had a couple of issues that turned us off. The whole weight of the step is held by four Philips head bolts. That’s not very reassuring, and because these bolts are the only method of attaching the step it means it would be very easy to steal. WeatherTech make a plastic step for the hitch with a relatively small rectangular profile. We’ve seen this in person and it’s actually pretty strong and fits pretty well in the Mercedes factory hitch. Carr make something a little different. The Carr 183242 HD Hitch Step sits in the receiver and folds down when you need to use it. When it’s folded up, it takes up less space behind you. Thanks Dan for the tip in the comments. Bully and GoRhino both make tube style hitches. At the time we ordered ours, Bully’s step with the LED brake light incorporated was cheaper than their plain version. Go figure. We didn’t want the extra complexity of the built-in light, plus it comes with a 4-pin electrical connector rather than a 7-pin. The Bully is also available in a polished steel/chrome finish if that’s your preference. If the step also serves as a crumple zone, it might reduce the amount of energy that a car behind you has when it actually hits the van. We aren’t sure exactly how much advantage you’d get from having such a small absorber. We also aren’t sure whether the hitch itself is designed to withstand impact-style stresses. Still, if protection is your thing, there are some options for you. Several of the regular step bumpers will collapse on impact. Some Amazon reviews of the WeatherTech BumpStep suggest it helped dissipate some of the force of crashes. Sparebumper.com sell something they call an attenuator. It’s a receiver mounted bar/step with a built-in shock absorber. We didn’t like their “think of the children” style scare tactic sales pitch, but if the product actually works, then it could be a good idea. Not cheap though (and yes, they are always available at the special sale price). A receiver shackle bracket is probably the smartest option for attaching a recovery strap, but it doesn’t really provide a good platform for stepping on. Smittybuilt solved that problem with their Beaver Step. It’s got locations for mounting straps and it is shaped like a step. A step with a very pointy rear end that would impale the radiator of any car stupid enough to get too close to you. We carry a recovery strap and shackles and this so step was tempting, but it doesn’t have a non-slip surface and the sharp edges were just a little worrying. We also weren’t sure whether it would have clearance for the trailer wiring harness on the stock tow hitch. We just spent money on a hitch step. We don’t want to donate it to the next lowlife to walk past. Locking hitch pins aren’t exactly high security devices, but they’re enough to deter an opportunistic thief. The problem with the factory Sprinter hitch is that it has a massive additional lump where the trailer wiring harness socket attaches. That lump is just where you’d want to reach in and lock your hitch pin in place. You can unscrew this metal monstrosity, but there’s not a good alternative location for it. That really just leaves the option of 90 degree locks. The Amazon reviews of most of them boil down to “It corroded so badly after a couple of months that I had to grind it off.” Not exactly reassuring. We ended up buying a Curt 21580 hitch pin because it’s got some extra length (in case we need to grind it off :-), and a Reese Towpower 7006600 coupler lock. The lock is cheap and nasty at under $5, but it should do the trick. 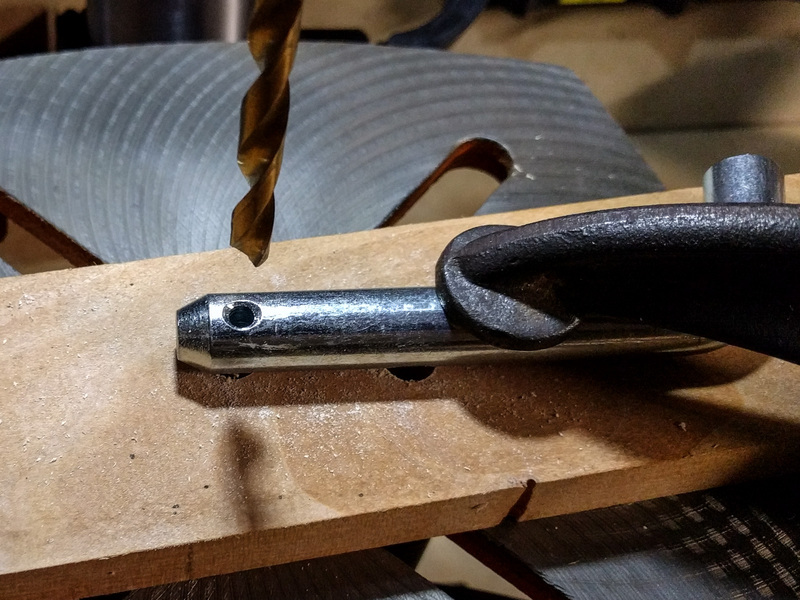 We had to drill out the hitch pin hole to fit the lock pin through. We also took the lock apart and filled the inside with grease. That’s a little too easy to do. The key basically acts as a screwdriver to unscrew the two halves of the unit. If you then remove the o-ring from the rear of the barrel, the whole thing slides out. Remove the key very carefully to prevent all the lock pins from springing out. Grease, reassemble, and fingers crossed it doesn’t corrode itself closed. 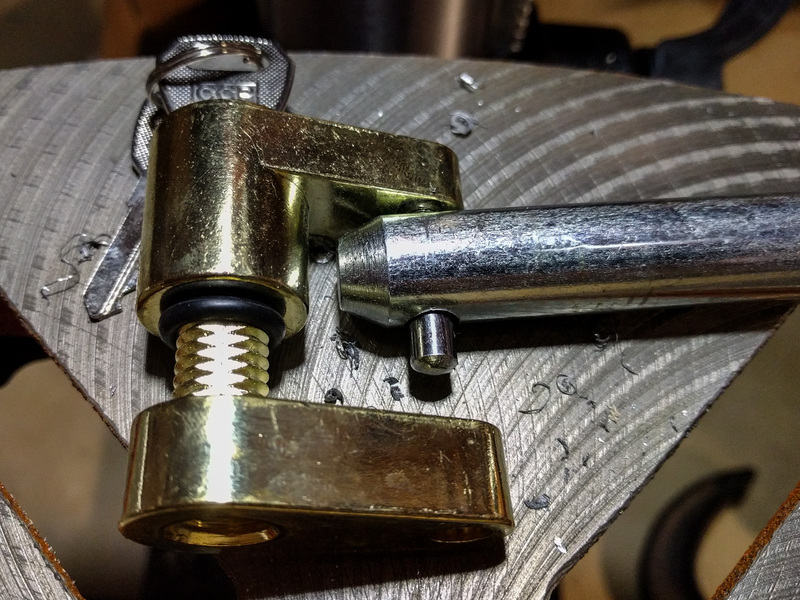 Now the lock fits through the end of the receiver pin. The o-ring in this picture is what holds the lock barrel in place. So far, the step has been working just fine. It comes with a little rubber wedge to slide in between the hitch receiver and the receiver mount on the step. The wedge looks flimsy but the double sided adhesive tape has held so far and stopped it from wobbling. It also looks pretty cool. We don’t really go in for the whole off-road nerf bar/roo bar thing, but this step wouldn’t look out of place on a van with all the bolt-on extras. The hitch is quite light. The metal of the curved tubular section is thin. It’s fine for supporting someone climbing into the rear of the van. We wouldn’t trust it with a recovery strap and we’re pretty sure it would collapse nastily even in a low-speed crash. But that’s the point. If it absorbs some impact shock, it makes it more likely that our van will survive the encounter. Thanks Dan – this is almost a different category of hitch step. My guess is it doesn’t stick out much behind the vehicle when it’s folded up. That could be really helpful if you’ve got a tight parking location. I’ve added this to the post.